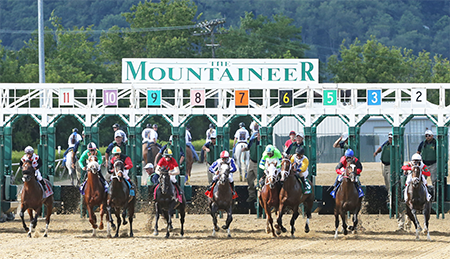 Mountaineer Park is scheduled to remain closed through November 21st due to an outbreak of Legionnaire's disease. Located in Newell, West Virginia, several employees became seriously ill with four confirmed cases of Legionnaire"s disease, a form of pneumonia, within the community. The disease is spread through the air and by breathing in mist containing the Legionella bacterium. The disease does not spread from one person to another but via air condition systems, etc. where a the bacteria has become airborne. Symptoms usually begin 10 days after exposure. Only the clubhouse and grandstand buildings are affected by the closure and has resulted in a loss of 16 racing days so far. The track was closed October 28th. The casino, hotel and restaurants are not affected by the closure, as they are separate buildings from the grandstand. The barns are not affected and training has continued for horses. Due to safety concerns over the Woodbine turf lodged by the jockeys on November 10th. On November 11th, they ran on the turf again and jockeys claimed that they felt coerced to do so. Thus the controversy began. At 26 degrees Fahrenheit, the jockeys lodged complaints about the safety of the turf stating it was dangerous with frozen spots and soft spots. They stated it was unsafe to ride as the horses were stumbling and have a hard time covering the turf. Woodbine management moved the turf races to the dirt. It was finally decided by Woodbine management that all turf races for November 16-18 were moved to the main track. As of Saturday, the 17th, Woodbine has canceled turf racing for the year. "Given the nature of our turf course - it has a sand base and holds a lot of moisture - it"s going to melt and soak in. Maybe now it's time to call it off," stated Jonathan Zammit, Woodbine's vice president of Thoroughbred racing operations. Saturday, November 17th, Golden Gate Fields canceled its second day of racing due to poor air quality from the fires in Northern California. While the Camp Fire, which started November 8th is well north of the Bay area, it has not yet been fully contained. The result is that the Bay area has been blanketed with smoke and has forced the closings of many public venues. The EPA classifies air quality in the range of 201-200 as "very unhealthy." As of Saturday, the air quality score at Golden Gate was 228. The track has been consulting with UC Davis on equine air quality guidelines, but there aren"t any hard rules when it comes to horses and officials have been following human guidelines. The main issue is that the air quality score has been fluctuating rapidly throughout the day, making it impossible to predict.